“Gaucho Dialogues on Leadership and Management” analyzes Latin American militias as organizations, highlighting the elements that best fit people who see themselves as members of groups—a description that fits the vast majority of the world. Among militias, loyalty largely overrides merit and can align a people into highly effective action, a characteristic that business organizations wish to promote. Saladeros were the 17th–19th–century Pampa beef industry businesses where the beef was sun-dried or “jerked.” Alfredo Behrens suggests that in such lifeless routine work there was little glory to be found, at least as capable of enthusing workers to perform to their highest potential. The trouble, Behrens argues in “Gaucho Dialogues on Leadership and Management,” is that most subsidiaries in developing countries are managed as modern saladeros. Latin Americans are brought up in the medieval Catholic tradition of detachment from worldly material gain. Profit is disdained, largesse and martyrdom are praised. Behrens illustrates the Latin American organizational how-to through a dialogue attributed to two famed nineteenth-century iconic literary characters, Martín Fierro and Don Segundo Sombra. Fierro is construed to espouse the passionate, nonpragmatic, xenophobic attitude popular among many Latin American leaders of the twentieth century. Sombra, on the other hand, espouses a more nuanced affection toward old ways, suggesting that they may be responsible for some of the economic and technological backwardness of Latin Americans. 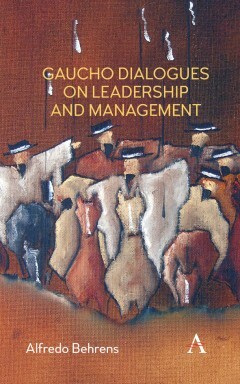 “Gaucho Dialogues on Leadership and Management” carries the reader through militia-led insurrections from Argentina and Uruguay through Brazil, Venezuela, Central America, and Mexico. Fierro and Sombra comment on the insurrections and draw lessons about leadership, strategy and people management in Latin America. While the book’s argument covers the ethos prevailing in the Americas, both North and South, Behrens believes it may be relevant elsewhere among similar societies where people prefer to act as members of clans than as autonomous individuals. If so, the book’s argument may be relevant for the vast majority of humankind at work. Alfredo Behrens holds a PhD from the University of Cambridge. He writes and speaks on leadership and management in cross-cultural settings. He also lectures at top business schools and has addressed large management meetings in four continents. Preface to the English Edition; Preface to the Portuguese Edition; Acknowledgments; Introduction; Chapter 1 Fierro and Sombra Head for Mexico; Chapter 2 The Unquenchable Thirst for Honor: The Gladiator; Chapter 3 Martin Fierro Inspires Perón’s Leadership Style; Chapter 4 The Siege of Montevideo; Chapter 5 Fierro and Sombra Discuss Leadership Theory; Chapter 6 Fierro and Sombra Follow the Federalist Revolt in Southern Brazil; Chapter 7 The Unquenchable Thirst for Honor: The Bullfight; Chapter 8 In Venezuela Fierro and Sombra Assess the Marcha Restauradora; Chapter 9 Panama Secedes from Colombia and Fierro Looks for Heroism in Costa Rica; Chapter 10 Fierro and Sombra Discuss the Leadership of the Mexican Revolution; Chapter 11 Contrasts with American Military Leadership: The Punitive Expedition; Chapter 12. Epilogue; Glossary; References; Index.